Welcome back. During our latest swing through New York and Virginia, we visited with my daughter Rachel and son-in-law Mike. He’s an abstract painter. I’ve featured his work in a blog post (Abstract Memories Photo Addendum) and his websites are on the Blog Watch List (Mike’s Paintings, Dunham Enfield Art). I mention this, not only so you’ll view and purchase his paintings, but because he and I spoke briefly about analyzing artwork--not as an art lover or critic, but from the standpoint of who really painted that painting? 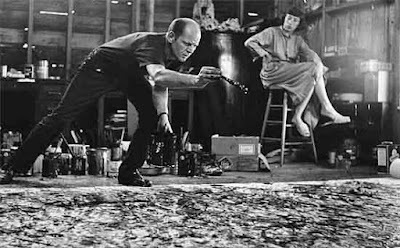 I had seen a recent study that used machine vision to authenticate Jackson Pollock’s paintings, and Mike was interested in learning more about it. Jackson Pollack (1912-56) was the leading figure of the art world’s Abstract Expressionist movement that followed World War II. Best known for his action painting technique, he would drip, splash and pour paint onto the canvas, placed on the floor or against a wall, manipulate the paint with knives, trowels or sticks rather than soft brushes and sometimes add sand or other material for depth. Pollock also led the all-over style of painting, which shuns any clear point of emphasis on the canvas, such as the face of a person sitting for a portrait. The all-over painting style gives equal attention to all parts of the composition, independent of the canvas size; it invites the viewer to roam, following colors, lines and shapes. Background for the latest study is provided by a 1999 analysis of Pollock’s paintings by researchers from Australia’s University of New South Wales. They showed that the patterns were fractal. A fractal is a never-ending pattern, infinitely complex, that has the same structure (is self-similar) at different scales. Though we can easily measure the dimensions of a line, rectangle or cube, we have a harder time with complex objects, the classic example for fractals being the length of the coastline of Great Britain. Fractal dimension allows measurement of the degree of complexity of an object by evaluating how fast the measurements increase or decrease as the scale changes. I’ll pass on describing the algorithms but note that there are different types of fractal dimension, the most commonly used being self-similarity and box-counting. The 1999 analysis of Pollock’s paintings used the latter, dividing images of his paintings into boxes of different sizes and recording the fraction of boxes containing part of the painted pattern as the basis of the fractal dimension. While the 1999 study concluded that fractal analysis could be applied to characterize and authenticate Pollock’s paintings, later work by researchers from Case Western Reserve and Arizona State universities questioned that conclusion. Later still, investigators at Ricoh Innovations showed that the fractal feature could indeed be useful when combined in a classifier that employed multiple image descriptors. Which brings me to the study that I spoke about with Mike. The researcher, from Lawrence Technological University, scanned 26 paintings by Pollock and paintings by others who tried to mimic Pollock’s style, extracting over 4000 numerical image descriptors from each painting. Comparing them computationally, he found the image descriptors were able to differentiate Pollock’s paintings with an accuracy of 93%. Fractal features were the most discriminating image descriptor but other descriptors showed substantial differences (e.g., Zernike polynomials, Haralick textures and Chebyshev statistics). Pollock’s painting style was truly unique. It may not be fully distinguished with fractals or any single mathematical descriptor, but when different image descriptors are combined, his paintings are computationally separable from those by other artists who would try to copy his work. And if computational approaches to detecting art forgery seem a bit much, you and of course Mike know from movies and television that there are other ways to authenticate a painting. I’ll highlight some of those in next Tuesday’s blog post. Thanks for stopping by.